You say both town and city. Is it a city or a town? Too late for me because I already chose my answer. But I am curious if it is a town or a city. No matter what, the beads are exquisite as always. How do you keep topping one design with the next Sita? They keep getting better with each new addition. Your creativity knows no bounds. Orvieto it has all of the architectural elements. I spent six hours trying to solve this conundrum. It is Orvieto 100% for sure. This puzzle was fun and kept me busy through insomnia. @bubbagump wrote: You say both town and city. Is it a city or a town? Too late for me because I already chose my answer. But I am curious if it is a town or a city. No matter what, the beads are exquisite as always. How do you keep topping one design with the next Sita? They keep getting better with each new addition. Your creativity knows no bounds. The English would regard it as a town. It is ok to give it another try. Don't let it keep you awake! 'The devil is in the detail' as they say, and I believe that is what sets us apart from most other brands. There is beauty to be found in unexpected, or less obvious I'd rather say, places. And these beads are an (another) example of it. Therefor I'm delighted you like the designs that we do. Knowing that our work is appreciated, and bought of course, keeps us going! These Faerybeads new creations are great! OK I gave it another try ORVIETO. Stunning beads! My guess is Pisa, Italy. sooo, would you be strolling in the Piazza Pretoria, Palermo? My heart wants these beautiful beads to represent Florence, but my mind says they look more like Ostuni! @trollbelle wrote: My heart wants these beautiful beads to represent Florence, but my mind says they look more like Ostuni! We tried to capture in these first designs a few details of the many magnificent historical, architectural buildings that can be found abundantly in this country. Our new beads pay a tribute to these majestic creations. While Florence, Siena, Palermo, Orvieto, Venice, Rome, Assisi, Pisa, Napels are just a few of the larger places that are perhaps far more interesting from an architectural perspective, it struck me this relatively rather common but historical interesting building had such a unique patterned dome. I was unable to find a similar example. After more browsing following your helpful hints I believe it is Ostuni as well. Thanks for the fun clever contest! @Trollsister wrote: After more browsing following your helpful hints I believe it is Ostuni as well. Thanks for the fun clever contest! You could actually be right with Ostuni. It was a tricky question Minty, there is an abundance of amazing architecture in Italy. I thought it was Pisa for sure since it is a UNESCO World Heritage Site. Oh well, still don't know for sure! Couldn't have narrowed it down without those hints, thanks Sita! And the beads are truly gorgeous, I absolutely LOVE the chevron pattern. 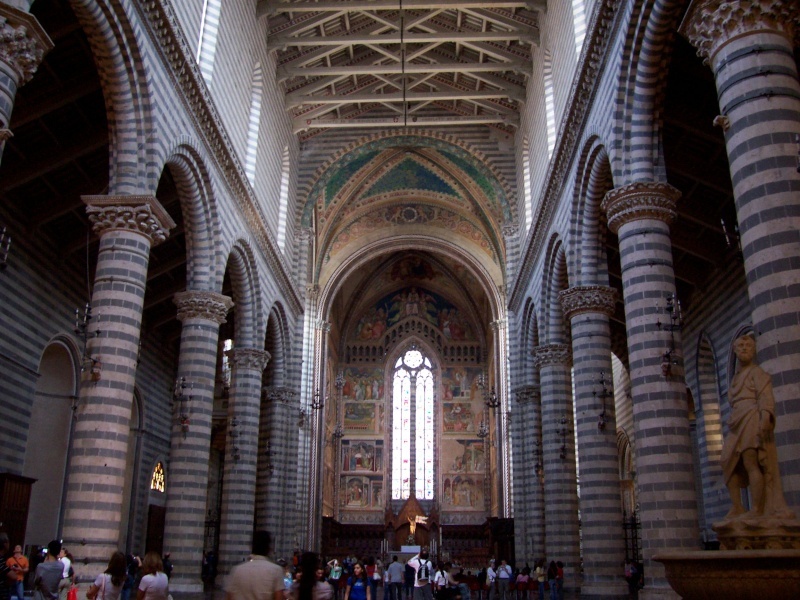 But I have never heard of Ostuni beeing " famous for it´s historical architecture "
But look at the cathedral in Orvieto. The wood trussed ceiling looks like the markings on the top of the bead with the arches being the center portion of the bead, and the floor being the bottom part of the bead. And the Rose Window and four sided design on the wheel bead. It's a real conundrum. This is so much fun. I'm sticking with Orvieto. Yes, Yes, Yes, it is Ostuni. Unmistakably Ostuni. It's all there. The dome with the chevron design. 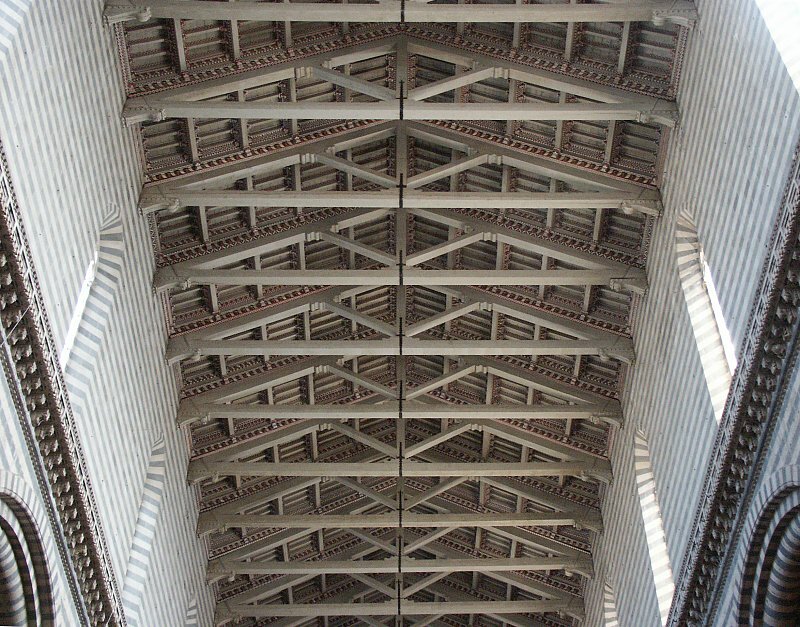 Ha Ha Ha I have to laugh very, very hard at myself for thinking the wooden trusses in the Orvieto Cathedral represented the chevron design. There are no domes in Orvieto. I was so sure the wooden trusses represented the chevron. 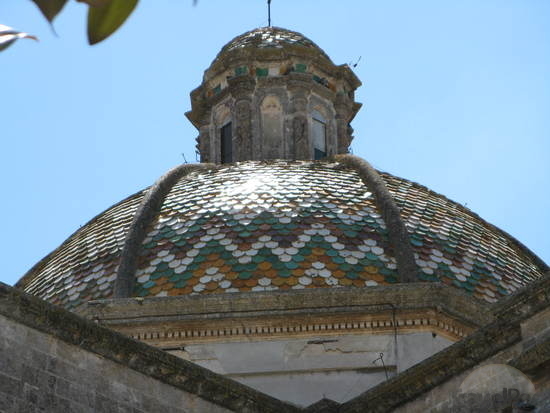 Ostuni has many domes throughout the city (one of your clues). 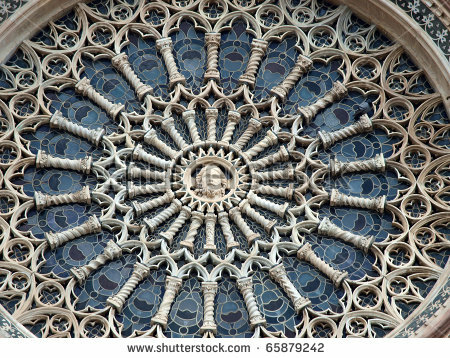 And the rose window. 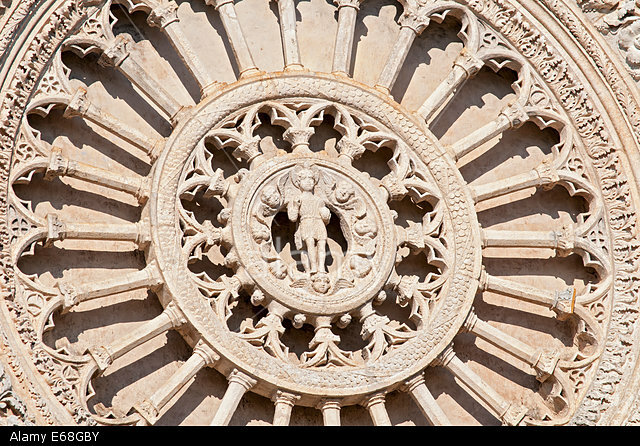 I even see many tiny wheels within the rose window design in Ostuni. It's incredibly beautiful there. It reminds me a little bit of Santarini because of the white buildings. 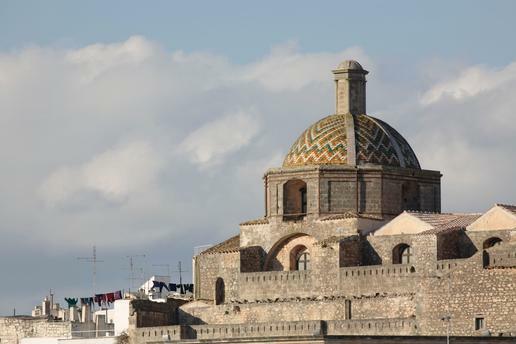 I would love to visit Ostuni one day. It looks like a very lazy peaceful place to visit for a relaxing vacation. The water, and the white buildings are so very beautiful. This is why I love this Forum. The international presence is very educational for me. A few days ago, I knew nothing about Ostuni, Orvieto, or Siena. I can tell my husband that beads can be educational too!